If you’ve ever been intimidated to make a souffle, don’t be! I promise it is really simple to make and tastes AMAZING!! 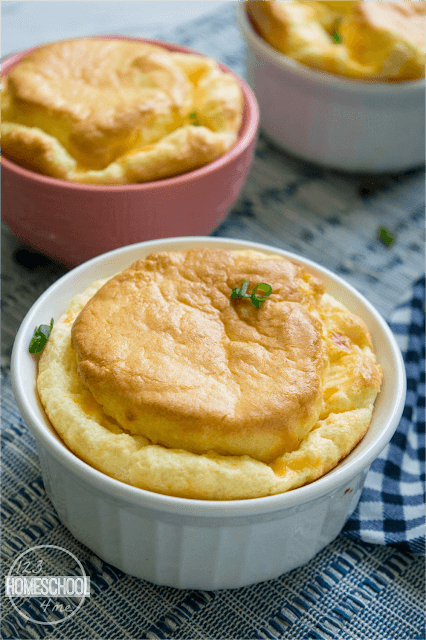 This Easy Cheese Souffle Recipe is going to be your families new favorite!! 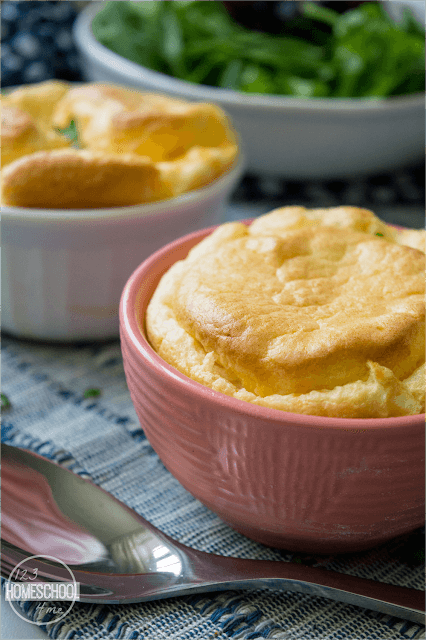 I grew up with this absolutely delicious Easy Cheese Souffle Recipe. It is one of my all-time favorite meals! 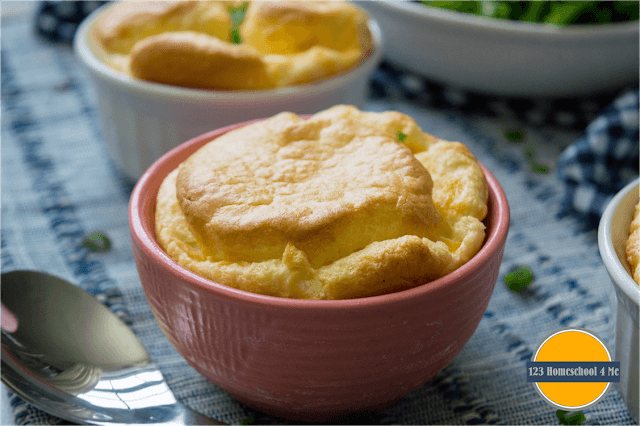 The Cheese Souffle is easy to make, tastes amazing, is a nice light dinner (or breakfast), and is great for stretching a buck. The key to this recipe is to have everything all set-out and ready to go so you can quickly add things. It only takes a couple minutes to whip together, then just pop it in the oven for an hour and you are all ready to enjoy this scrumptious egg recipes. Measure 3/4 teaspoon salt, 1/4 teaspoon dry mustard, 1/8 teaspoon pepper, and 1/8 teaspoon nutmeg together in a little bowl. Separate 6 eggs making sure the whites are in a bowl large enough to mix with 1/4 teaspoons cream of tartar and an egg beater. Start out by making a roux – that’s just a fancy term for what is going to thicken your sauce. In a large pot heat over medium heat 6 Tablespoons butter. When it is melted add 6 Tablespoons flour and your seasoning: salt, pepper, dry mustard, and nutmeg. Whisk it together continuously for about a minute until it is ever so slightly turning golden. Add pre-measured 1 1/2 cups milk; continuing to whisk continuously as it will start to thicken. 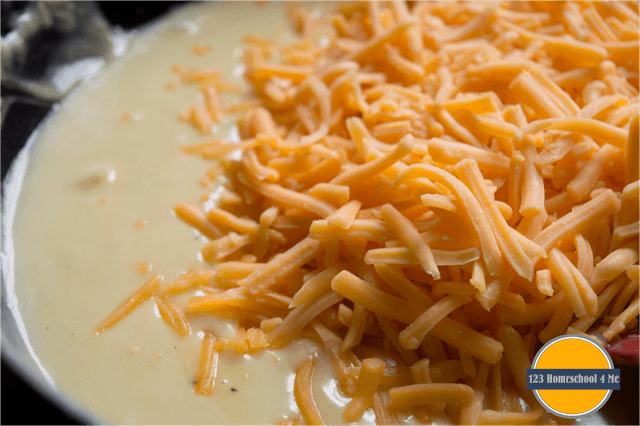 When it has thickened (3-4 minutes); remove from heat and add 6 egg yolks and 2 cups shredded cheddar cheese and whisk until it is well combined. Pour into your large pot and stir only to combine (don’t over mix); pour into ungreased 2 quart souffle dish. Sprinkle the top with a dash of cayenne pepper. Cook for 55 minutes (or 25 minutes for individual ramekins). Don’t open the oven! It will make your beautiful souffle fall in the middle. How gorgeous does that look?! Be ready to serve it right away as the center will start falling within minutes. It won’t affect the taste, but I like to have everyone at the table to watch the gorgeous souffle come out of the oven straight to the table. 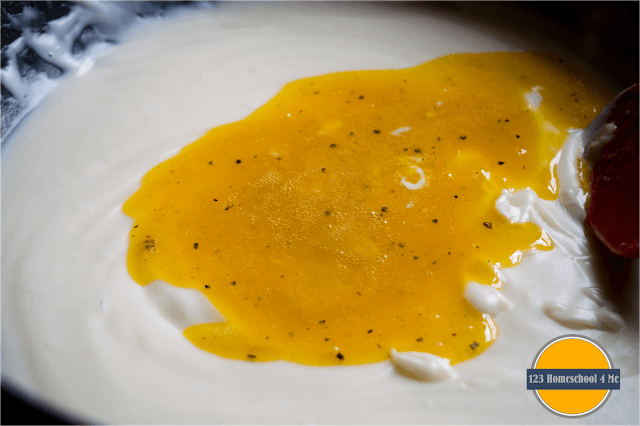 It is light and fluffy, amazingly flavorful, super yummy, and the best egg recipes if you ask me! It’s amazing how far this recipe can stretch an egg! It is perfectly fluffy and scrumptious! If you've ever been intimidated to make a souffle, don't be! I promise it is really simple to make and tastes AMAZING!! 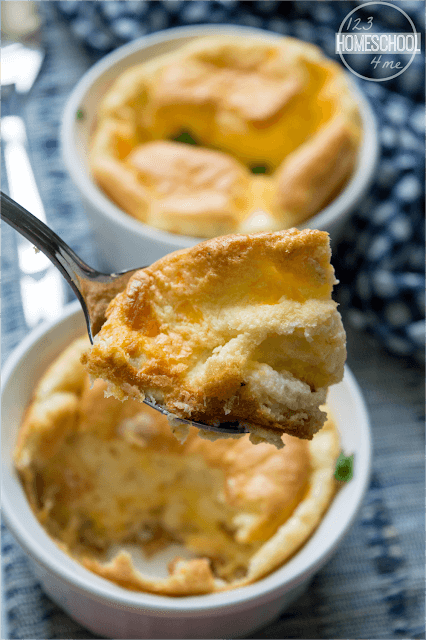 This Cheese Souffle recipe is going to be your families new favorite!! Start out by separating 6 eggs. In the small bowl with the egg yolks add salt, pepper, ddry mustard, and nutmeg. 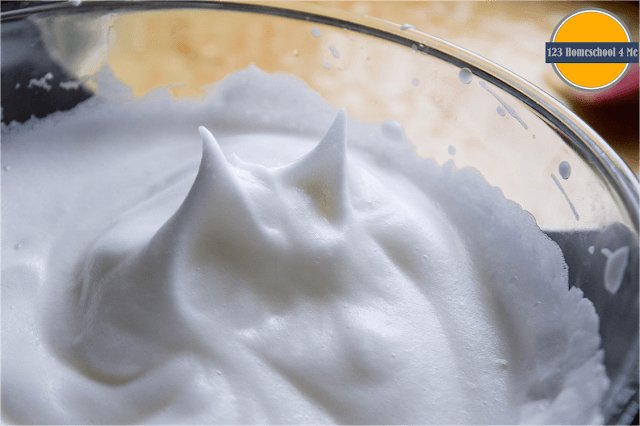 The egg whites go in a small/medium bowl with 1/4 teaspoon cream of tartar; use whisk or egg beater to mix until white and foamy. HINT: I like to set out the milk and cheese on the counter so it is ready. In large pot melt 6 butter; add 6 Tablespoons flour and whisk over low/medium heat until very slightly browning. Quickly whisk in milk, stirring constantly so no lumps form. When it has started to thicken remove from heat and add whisk in egg yolk mixture and cheddar cheese. Fold in egg white mixture and pour into ungreased souffle dish (or casserole pan). Bake at 350 F for 55 minutes until puffed and golden. Serve IMMEDIATELY or it will start deflating. This makes a nice light dinner served with a salad or for brunch with potato casserole.